This show has been postponed due to weather. The new date for the CD release is Saturday, June 20, 2015. Tickets for the February 21st show will be honored on June 20th. If you would like a refund, please call the box office at 508-405-2787 (Hours: Tuesday - Saturday, 12:00 PM - 6:00 PM). 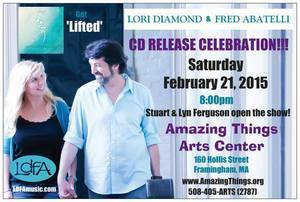 Lyn and Stuart will be opening the show for Lori Diamond & Fred Abatelli as they celebrate the release of their new CD.